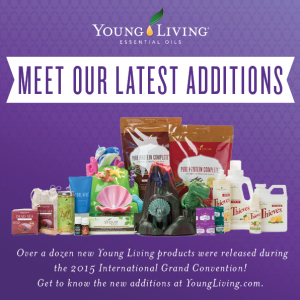 The 2015 Young Living International Grand Convention in Dallas, Texas was an unforgettable experience! Over 20,000 Young Living members gathered from around the world to celebrate the past year’s achievements, collaborate ideas, attend workshops, and get a sneak peek at 18 new products. 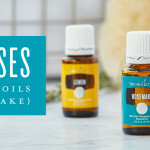 Thieves Fruit & Veggie Soak & Spray: Two unique products designed to safely and effectively wash produce with the power of Thieves essential oil blend. 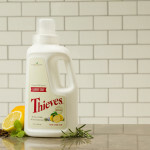 Thieves Dish Soap: Leaves dishes sparkling clean with a plant-based formula that doesn’t compromise on efficacy. Thieves™ Liquid Laundry Soap: Gently and naturally washes laundry items with essential oils and natural cleansing enzymes, leaving them fresh and clean. Light the Fire Essential Oil Blend: Specially formulated for this year’s convention and supports an inspiring environment when diffused. Northern Lights Black Spruce essential oil: This new essential oil from Young Living’s Northern Lights farm in British Columbia, Canada, has a rich, woodsy, and invigorating aroma. Essential Peel (available for a limited time): Individually packaged, single-use cotton swatches saturated with pre-diluted essential oil. Available in Lavender or Peppermint. NingXia Zyng™: A light, sparkling beverage with black pepper and lime essential oils, wolfberry puree, and white tea extract. Master Formula multi-nutrient complex (available in September): A multinutrient complex that provides vitamins, minerals, and other food based nutrients to support general health and well-being. 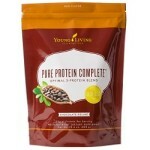 Pure Protein Complete: Delivers 25 grams of protein per serving. Available in Chocolate Deluxe and Vanilla Spice. Slique Bars, Chocolate-Coated (Coming Soon): Packed with exotic fruits and nuts, cacao nibs, essential oils (Vanilla, Cinnamon, and Orange), and a dark chocolate drizzle. Cool Azul Sports Gel: A blend of Peppermint, Plectranthus Oregano, and Dorado Azul essential oils that provides a cooling sensation when applied topically. Dead Sea Mud Soap and Bath Salts (available for a limited time): Treat yourself to an indulgent spa experience with luxurious properties only found in the mineral-rich waters of the Dead Sea. DinoLand Ultrasonic Diffuser: Take your child on a prehistoric safari! Provides a unique essential oil experience that captures your child’s imagination with fun, interchangeable covers. Dolphin Reef Ultrasonic Diffuser: Dive into a deep sea adventure! Provides a unique essential oil experience that captures your child’s imagination with fun, interchangeable covers. 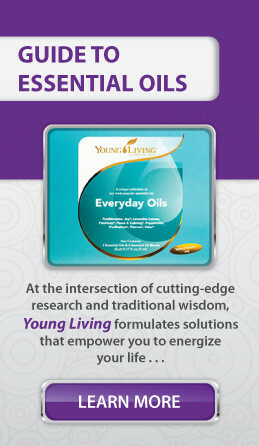 I hope you are just as excited as I am about all of these new Young Living products! Which ones are you looking most forward to trying? Please let me know, and get in touch if you have any questions!